The success in using the platform is related to the behaviour how we use social media platforms and how others treat us. Unsolicited connection requests from unknown people – without any hint and often from abroad – offset the prospective business gains for less active professionals. It takes quite a long while before LinkedIn blocks stalkers who send hundreds of connects without a notification – what I call the “deadly sin” of distraction. Handling too many of those requests prevents members to actively use the platform seriously. This doesn’t happen in real life, especially in the Asian custom to hand over business cards using both hands showing respect to the other person. More recently, there is a visible trend towards quantity in LinkedIn connections. Rahul Kumar, CEO of Resonate Business Ignition, strives for qualitative engagements and suggests deleting connections if they don’t lead anywhere. He proposed “to develop a network of relevance, with consistency” in his article LinkedIn Network - Quantity or Quality?. Regarding unwanted arrival of connection requests, social selling expert Mark McInnes accepts only two out of five requests confirming: “I'm actually seeing less personalised requests in the last 6 months. I fear most people have gone connection crazy and are just loading up with almost anyone. As if it's a competition to see who can 'get' the most connections.” This will destroy the LinkedIn experience as the conversations won't be targeted enough for people to take any value from them. Mobile and tablet internet usage exceeded desktop for first time worldwide with 52% in a report from StatCounter in 2016, also due to convenient apps offering a focused feature set with less distraction. Most users of the native LinkedIn app simply click on the “Connect” button while only the desktop site suggests adding a note. The three little dots (iOS) or the drop-down arrow (Android) at the top of the app were too far out of sight, more recently LinkedIn moved them down next to the “Connect” button. A little hope for a better connection experience? 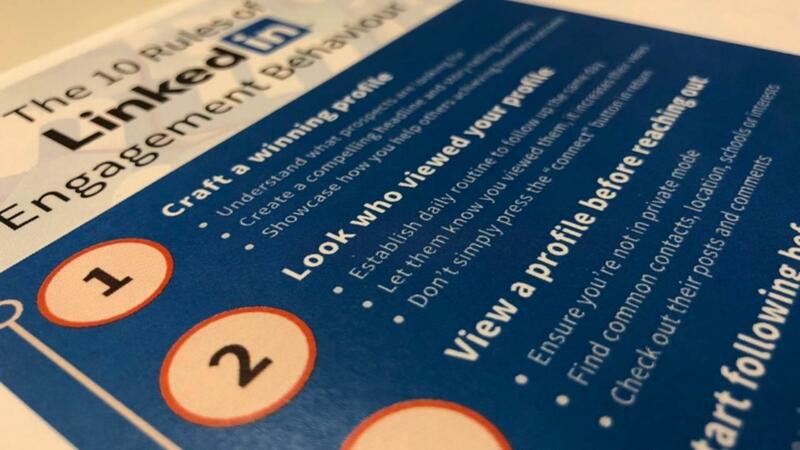 How to behave properly and use LinkedIn as the best possible engagement tool? Let’s first clarify: LinkedIn is not just a place solely for job seekers with static profiles. It is also not a market place to sell transactional products, rather Facebook likes to play that role. The similar search for new contacts could compare LinkedIn even to a dating site as provocatively mentioned by Tony J. Hughes. The real benefit from LinkedIn is the possibility to engage with people we don’t know yet, not just to stay in touch with former colleagues. As John Smibert recently pointed out: “Customers will engage with those who they perceive have the intent and expertise to help them achieve their desired outcomes.” According to LinkedIn’s own statistics, sending InMails results in a hit rate up to 25% which is 300% higher than sending emails. But that works only when reaching out wisely. Back in the Age of Enlightenment, the German philosopher Adolph Knigge published his book “On Human Relations” in the year 1788 as a guide to good behaviour, politeness and etiquette. Although his work has been intended rather in a philosophical way than a practical book, it is still referred to for good manners. With the advent of the World Wide Web, the term netiquette was born, but nearly lost in the meantime. I created ten rules of LinkedIn behaviour might indeed act as a practical guide. They will help especially when changing industries, careers or even geographies to build a new network from scratch. You can find those ten rules here. Using those rules collectively, LinkedIn becomes a better place for social engagement on the base of curiosity within a sharing community. The mentioned “deadly sin” of unsolicited connection requests will be replaced by respectful communication. Featured image of Adolphe Knigge shared by CC BY 2.0 licence of Axel HH on Wikimedia – Public Domain/ J.C. Penney – Don O’Brien flickr. Photo from Japanese business cards by Yasuki Hirata.